Continuing a series dating back to 2006 is the 2013 American Eagle Silver Uncirculated Coin. Each is struck from one ounce of .999 fine silver and features a diameter of 40.60 mm. This series of coins has appeared annually from the US Mint since debut, with the exception of 2009 and 2010. Those years saw intense demand for the related bullion coin forcing the US Mint to cancel these numismatic releases as it diverted available blank planchets towards that bullion production. When these uncirculated Silver Eagles debuted in 2006, it was considered part of a celebration of the twentieth anniversary of the Silver Eagle Program. 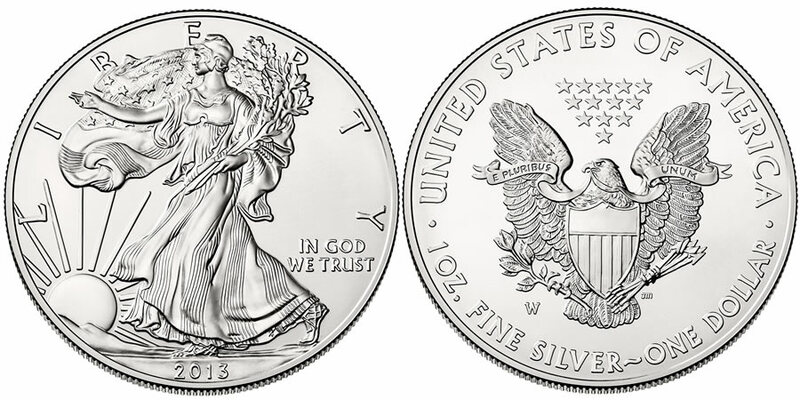 Since 1986, the US Mint had been producing bullion and proof Silver Eagles. All three varieties feature the same basic specifications and designs, but differ in finish and intended buyers. These uncirculated and the proof coins are struck for numismatic purposes and sold directly to the public in limited mintages. The related bullion Silver Eagles are typically struck to meet demand and are sold through the Mint's network of authorized purchasers for a small premium above the current spot price of the silver contained within them. All silver eagles contain the same obverse image of "Walking Liberty" as originally designed by Adolph A. Weinman for the 1916-1947 half dollar coin. Obverse inscriptions include LIBERTRY, IN GOD WE TRUST and the year of production. US Mint engraver John Mercanti designed the reverse image of a heraldic eagle with shield. Reverse inscriptions include E PLURIBUS UNUM, UNITED STATES OF AMERICA, 1 OZ FINE SILVER and ONE DOLLAR.